WASHINGTON, Sept. 28 (Xinhua) -- China and the United States on Thursday vowed to push for renewal of their wide-ranging ties in scientific and technological cooperation, as part of efforts to advance social and people-to-people exchange between the two countries. 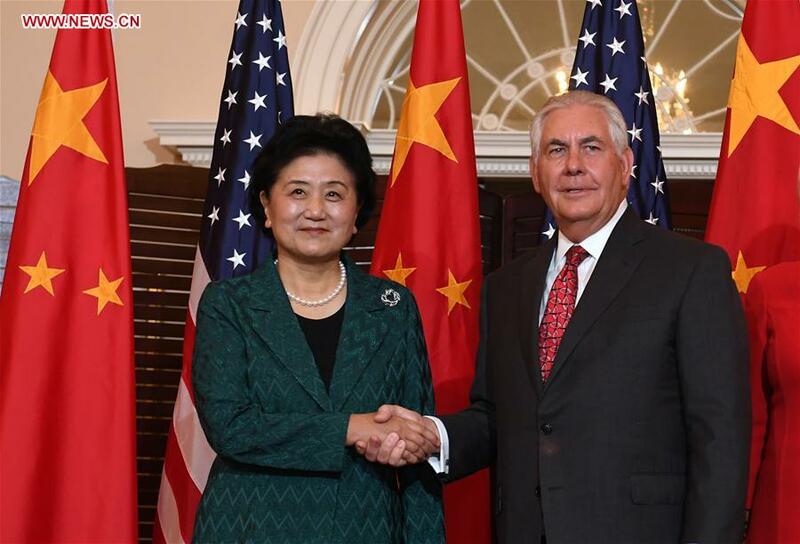 The agreement was reflected in an action plan of the first China-U.S. Social and People-to-people Dialogue, co-chaired here by Chinese Vice Premier Liu Yandong and U.S. Secretary of State Rex Tillerson. The scientific and technological cooperation between the two partners dated back to 1979 when they signed the China-U.S. Science and Technology Cooperation Agreement (S&T Agreement), under which the two countries have since reached nearly 50 inter-agency agreements and jointly supported thousands of cooperative programs. The cooperation in terms of science and technology have benefited researchers and governmental agencies of both countries as they have been able to share with each other research data, resources, equipment and expertise of their own. The action plan said China and the United States are committed to concertedly pushing forward the renewal of the S&T Agreement, while strengthening joint scientific research, exploiting ways for province-state cooperation on technological innovation, and promoting dialogue and cooperation between scientific and technological personnel of both countries. Besides, the two countries, added the action plan, will conduct exchange and dialogue in terms of cooperation mechanism and policy between scientific and technological agencies, encourage businesses of both sides to cooperate in areas of innovation and entrepreneurship, and move forward cooperation between technology-driven think tanks. China and the United States held their first Social and People-to-people Dialogue on Thursday in Washington D.C. It is one of the four high-level dialogue mechanisms established during a meeting between Chinese President Xi Jinping and his U.S. counterpart, Donald Trump.